Nightjar produce incomparably good limited-edition single story chapbooks (and, yes, I'm biased, but my love for them is genuine). M John Harrison's story intensely evokes the bleak and uncanny in a seaside town. The reality at the centre of the story feels like something you don't quite want to touch with your mind, but you're compelled to attempt it anyway. Hilary Scudder's story filled me with so much fear for the protagonist that it was an enjoyable, but almost painful read. 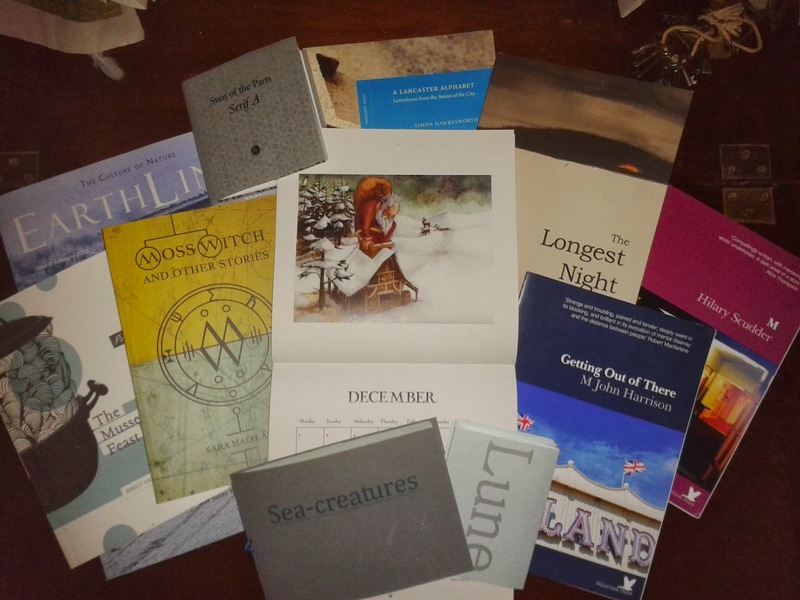 There are several other Nightjar titles still available. Stock up while you can as Nightjars will be taking on a different form after spring 2014. Available to buy from Nightjar Press. A collection of unsettling winter tales from Tom Fletcher, Jenn Ashworth, Emma Jane Unsworth, Richard Hirst, and Alison Moore with beautiful illustrations by Beth Ward (whose eerie birches, in particular, are stunning). My copy's just arrived and I'm looking forward to spending some cold evenings tucked up with this in one hand and a whisky in the other. This is the first single author collection to spring from Comma's Science into Fiction project. The title story is one of my favourite contemporary fairy tales and the strong vein of the mythic throughout presents enjoyable proof that a writer's engagement with science doesn't always come down cleanly on the side of sf or of literary realism, Sara's stories are often something else entirely. Sarah makes these beautiful creations in which the form of publication and poems intertwine to make a whole. Sea-creatures features maps and torn pages that echo the tide, Lune streams like the river it's named for across the page. Both publications are full of salt and water; there are mussels, brittle stars, selkies, seabirds, and a multitude of 'fragments of one world...washed up by another'. This calendar allows you to fill a year with Rima's wonder-filled artworks, and let the strange beauty in her images tug at you from the wall every day. The calendar is brilliantly designed by Tom Hirons and printed on recycled card by Footprint Workers Co-op. It's the only calendar I've ever owned that tells me the names of the full moons. The first two print runs have sold out. Keep an eye on Rima's Etsy shop just in case more become available. Available to buy from Fast Foot Press. The writing, the photography, in fact everything about this magazine of nature and writing, leaves me feeling like I've taken a long walk, often in landscapes that are completely unknown to me, with knowledgeable, welcoming guides. Peirene's beautifully designed and excellently selected novellas of translated European fiction are often understated yet visceral. Billed as two hour reads, every one I've read may have been short but they're the kind of stories you carry with you for a long time after. And, if you have children, I can't praise Okido, the arts and science magazine for 3-8 year-olds, enough (not pictured above because my boys' copies are all so well loved they no longer have covers). Information-packed, funny and with frequently bizarre illustrations, subscriptions are available here. And on my Christmas list... Posthumous Stories by David Rose available from Salt. David's stories are always subtle and often unexpected. This long-overdue collection gathers together twenty-five years of his work. Strong Room, a collaboration between artists Roelof Bakker and Jane Wildgoose, is inspired by the 'loss of tangible experiences and lack of physical presence in the digital world'. Not due out until late January, but worth the anticipation, it will be available from Negative Press. I'm also looking forward to the imminent arrival from Unsettling Wonder of my pre-ordered copy of Sister Fox's Field Guide to the Writing Life by Jane Yolen, which draws on trickster tales, copious treasures from fairy tale and myth, and the wonder in a life making stories. And can I please have a bucketful of time to make it possible for my reading to keep pace with my book buying habit?